You might have heard about Spider-Verse before - probably something about how crazy it is, or who cameoed where, or a few new characters. But if you don't follow the comics, it probably all sounds a bit confusing. 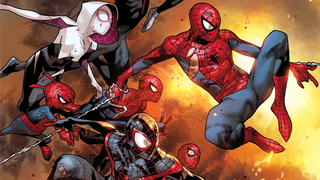 Here's a brief catchup on what you've missed, and what it means for Spidey's comic future. I won't spoil the major plot points of Spider-Verse in this explainer (especially at its most recent issue only came out yesterday), but there will be some minor discussion about certain points, and a few deaths that happen, but nothing big. If you're interested in reading the series and want to go in fresh, you can click away now - or click through to this thorough reading list by How To Love Comics to see every Spider-Verse related comic that you'll want to read. So yes, an extremely mild spoiler warning going forward. If you're not super familiar with Spider-Man's wider comic canon, you might not know that in the Marvel universe, heroes with powers derived from being a Human/Animal hybrid are actually known as Totems. They're a sort of spiritual link between the Human and Animal Kingdoms - so while Peter Parker's origins are that his powers were given by the radioactive spider-bite, in doing so he became part of this wider pantheon of spider-based heroes, serving across a variety of realities as avatars of a godlike being known as the Master Weaver, who watches over their fates with the Web of Life. Kinda crazy, right? There are plenty of totems, not just Spiders - Black Panther, for example, gets his abilities from the gods of the Panther Totem. Enter Morlun, a long time foe of Spider-Man, who had been tracking the Spider-Totems across the multiverses and murdering one by one to feast on their totemic power, granting him even more strength. Spider-Verse is essentially all of these Spider-Totems coming together so they can fight the threat to each other as a group, rather than being slowly picked off. They were actually all brought together by a time-lost Superior Spider-Man - that's the mind of villain Otto Octavius (Doc Ock) trapped in the body of Peter Parker. COMIC BOOKS! - when he attempted to return to his own timeline and started discovering dead spider-heroes across the multiverse. Morlun, however, is also not alone. His family, known as the Inheritors, come from Earth-000 (that's not actually the main Marvel Universe, if you've not familiar with Marvel Universe numbering - that's Earth-616), and hunt down totems to feast on their life forces. They're basically vampires, but in a very specific way. Universe-hopping vampires! The Inheritors had been hunting various totems and their gods for many centuries to expand their lifespans, before they turned their attention towards the Master Weaver. In a battle that saw their Matriarch killed, Morlun and his family defeated the Master Weaver, but instead of feasting on the god they chose to imprison him, using the weaver's control of the Web of Life to hop between the different multiverses and attack the Spider-Totems. Morlun had actually been doing this on his own for a while - in fact, back when the character first appeared in 2001, Morlun attempted to feast on Peter Parker and was killed. When he was eventually resurrected (and long story short, thrown into limbo after trying to snack on Black Panther), he avoided Earth-616 for a while before reuniting with his family to initiate the Great Hunt, their plan to kill and consume every Spider-hero across all realities. It turns out that there's a lot of Spider-People. A lot of weird Spider-People, too. Part of what has had people so excited about Spider-Verse is the idea of getting to see so many different incarnations of Spider-Man interact and clash with each other - and to ultimately see them come together as they fight for their existence. 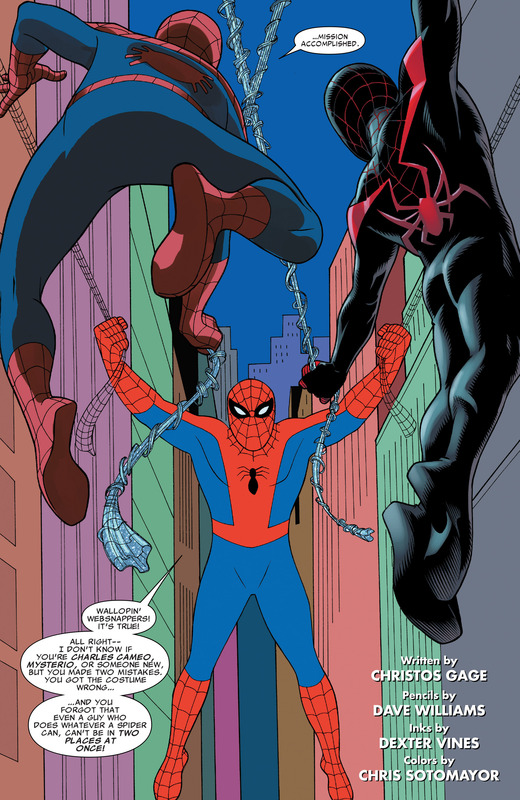 Plenty of prominent alternate Spideys like Miguel O'Hara (Spider-Man 2099), Mayday Parker (Spider-Girl of the MC2 universe, Earth-982) and Miles Morales (Ultimate Spider-Man) have played big roles in the overall story, but much of the appeal and the attention the event has gotten is from its willingness to acknowledge and delve into Spider-Man's huge history not just as a singular character but an identity worn across many stories. But it's not just Spider-Man's comic book past that has been mined with glee - Spider-Verse has recognised the character's existences across a variety of mediums, no matter how absurd. An adventure took place in the world of the 1960's animated Spider-Man cartoon (yes, that one where all the memes come from), the Advertorial Spider-Man who shilled Hostess products left and right got his own short story to be offed in, as did the cast of Spider-Man And His Amazing Friends. Hell, even the Sony movies got briefly recognised - with Tobey Maguire and Andrew Garfield's Spider-Men being not actors but actual Spider-Men in their own respective universes. If you've ever liked Spider-Man in any incarnation, there's a lot to love about Spider-Verse's celebration of the character. It's basically like a big anniversary event without being a big anniversary for him. It's not just been familiar Spiders that have shown up though - Spider-Verse has added a few new Spider heroes to the already massive roster. However two of the biggest newbies that will have an ongoing existence beyond the event, are female characters: Cindy Moon, a.k.a Silk, and an alternate Gwen Stacy, a.k.a Spider-Gwen. And interestingly, the fan response to them have been pretty much opposites. Let's start with Silk - who was created specifically for Spider-Verse. Cindy was actually at the school trip where Peter Parker was first bitten, the spider that bit his wrist biting her on the ankle before dying. Cindy's powers slightly differed from Peter - her Spider Sense is stronger, but her Super strength isn't as prominent - but shortly after they became known to her Cindy was taken from her parents and trained to use them correctly by Ezekiel Sims. Realising that as an Avatar of the Spider Totems as well Morlun would be hunting her, Cindy agreed to be locked away in a Bunker that kept her secret from the Inheritors, never to be released. However, Peter became aware of her existence during the Original Sin comic arc, and freed her (against her will - Cindy knew her release would bring Morlun and the inheritors knocking), where she took the moniker of Silk and fought along side the other Spiders. Fan's haven't been too keen on Silk's existence (the convenience of Peter's spider biting someone else being a bit much for some), but she's not going anyway any time soon - outside from her prominent role in Spider-Verse, she's getting her own ongoing series. Fans were much more keen however on Spider-Gwen. The character made her début in the prequel comic Edge of Spider-Verse #2 as a one off origin story that revealed an alternate universe where Gwen Stacy got bitten by the spider, rather than Peter Parker (who was Gwen's boyfriend - and actually became one of her first foes as that universe's Lizard), becoming Spider-Woman. Obviously she doesn't go around calling herself Spider-Gwen, because her secret identity would become known, duh! The reaction to the character - and her nifty costume - was so positive that, despite being originally intended to just be used in Spider-Verse, Marvel announced at New York Comic Con that Gwen would get her own comic series alongside Silk's, starting next month. Usually a comic event happens, and then is brushed away as characters progress and new events wind up - but this week, we basically learned that Spider-Verse was essentially a sort of trial run for what Marvel were planning for their comics going forward (and honestly, it kind of makes sense to use a character as popular as Spider-Man to do that). On Tuesday, Marvel announced that their next event, Secret Wars, would herald the end of the Marvel Universe as fans have known it for decades. Basically every alternate Marvel universe, but most importantly the 'normal' 616 universe and the Ultimate universe would be broken apart and smushed together as part of 'Battleworld'. All the different incarnations of Marvel heroes, including Spider-Man, will fight to save their universes but ultimately fail, leading to a new, singular Marvel universe made out of an amalgam of the various universes being born. But what does it mean for Spider-Man specifically? Well, it means that popular versions of the character - like Spider-Gwen or Miles Morales' Ultimate Spider-Man could be coexisting alongside Peter Parker in this new Marvel universe, now a part of the 'main' world instead of being part of what were essentially side stories trapped in their own universe-bubbles. They'd no longer be alternate realities or spinoffs, but characters that stand on their own right next to Spider-Man. 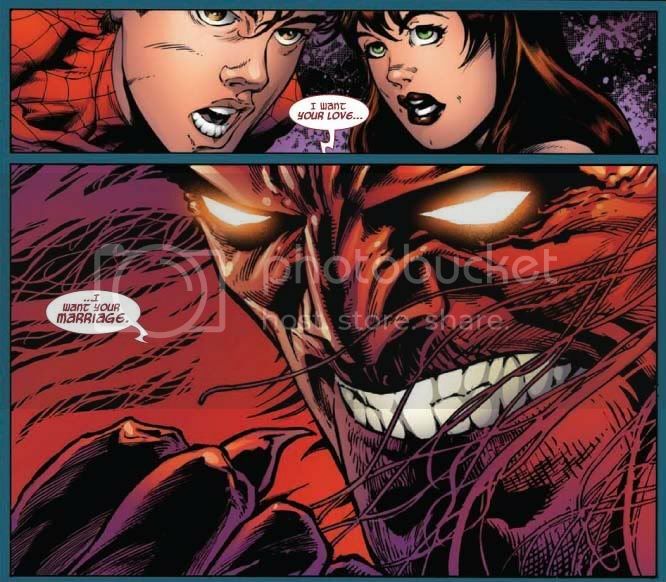 But there's another aspect of Secret Wars that will effect Spider-Man much to the delight of many of his fans - part of the post Spider-Verse/Secret Wars Universe will seemingly include Peter being happily married to Mary Jane Watson again, undoing the wildly unpopular events of the much derided Comic arc One More Day where his marriage was basically sold to the devil. Once again, COMIC BOOKS. So while Spider-Verse might basically have been a preview of the much bigger Secret Wars crossover shenanigans, it will bring about some pretty prominent changes to Spidey going forward too.